Hand-fastings have got to be for me, one of my favourite types of symbolic ritual. And that’s not easy for me to say, because I love EVERY ritual on the block. Not only is there something so natural and so organic about holding hands but there is also something very deeply romantic and spiritual about it too. Holding hands allows you to be connected to your darling during your ceremony and through that connection you can both experience the joy and love that your relationship gives you and celebrate that physically, as well emotionally. So let’s take a look at what a hand-fasting is all about. Hand-fastings are steeped in history and culture, which makes having one in your ceremony, even more symbolic. Coming from pagan and celtic roots, hand-fastings were originally carried out as a form of engagement. Couples took part in a hand-fasting to show their commitment to each other in preparation for the actual wedding some time later (I kind of like this idea too, an engagement hand-fasting. Watch this space!) The couple would then take each others’ right hand, one by one, each declaring in front of the nearest and dearest their intention to be the other’s spouse. Is that awesome or is that awesomel? I could sit here all day writing about the history of hand-fastings and their significance, as I find it fascinating but I know fear you may not share my fascination, ha ha! Nowadays, hand-fastings are very much a part of marriage ceremonies, and although they share the basic premise of the original rituals, they are now are carried out in a variety of ways, depending on who your celebrant is and how they carry it out. And I love this. I love that people can take something traditional and historical and put their own spin on it. I really don’t think there is a right or wrong way of carrying out a hand-fasting. Purists may disagree with me, but that’s cool! 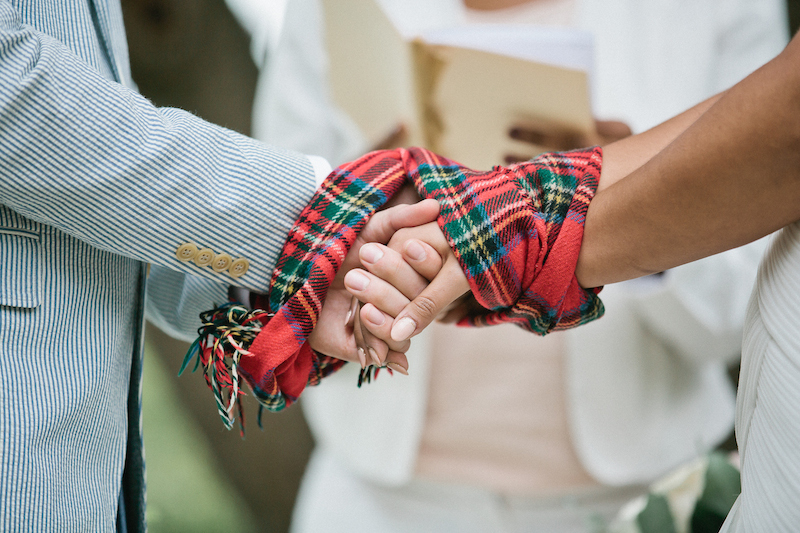 Some highly trained and specialist celebrants are able to perform complex marriage hand-fasting ceremonies, where the hand-fasting is the whole basis of the ceremony and everything that takes place during the ceremony is connected to it. Celebrants like these will tie the binds in specific ways and will guide the couple through a binding process, which also will incorporate the pledges that they will make to each other. The hand-fasting IS the marriage ceremony. Slightly different to hand-fasting ceremonies, is a hand-fasting ritual which can be thought of as a stand-alone element included within a marriage ceremony. So whereas the hand-fasting ceremony constitutes, more or less, whole wedding ceremony, the hand-fasting ritual is a small yet significant, self contained element that takes place within a wider wedding ceremony. It is usually carried out in the lead up to the couples saying their vows and exchanging their rings. For my own handfastings, I ask the couples to join both hands, by crossing their hands at the wrists. I like the idea of both hands being held to give a complete physical connection and so that couples can face each other, but equally if a couple want to hold just one hand then, that works too and many celebrants do it this way. I have had couples who wanted to read their vows whilst their hands were tied, so it worked for them to have one hand tied and one free hand to hold the card that their vows were written on. I loved that this couple chose a tartan scarf to reflect their Scottishness. Photo by Anna Gazda. As I’m not a hand-fasting specialist or purist, I allow couples to use their own materials which although very meaningful, can mean the binds that I create are not the most beautiful! But personally, I think that in terms of symbolism, it is more important that the hands are bound, not how they are bound. It’s also a really nice idea, where possible, to use material which is symbolic to you. I currently have one couple that I am working with who are looking at having some hand-fasting bind made from the same material as the bride’s wedding dress. I love that idea! In the past I have had couples use a scarf that belonged to the bride’s grandmother and a tie that was the groom’s father’s, which are such lovely ways to personalise ceremonies and honour relatives who have passed away. So you can use cord, rope, scarves, whatever material feels right for you and also of course, which is long enough (a metre minimum) to bind your hands. Years ago, when I first became a celebrant, I came across this beautiful hand blessing, which I love even til this day. I love it that when I read it out, and couples can look at each other and listen to those words and feel a very deep connection to each other during their ceremony. It is very emotional, to say the least. Beautiful, right? So as well as having some form of blessing read out whilst your hands are bound together, another variation is to actually say your vows whilst your hands are bound, with the binding being released after you have said your vows so that you can then go on and exchange your rings, with your free hands. A few years ago, I worked with a lovely couple to put together a personalised hand-fasting which would include their mums and which also allowed them to respond to questions vows which they designed, followed by personal pledges that they said to each other. Me: Brian and Jessie, will you share your lives openly together, speak truthfully and lovingly to each other, treat each other with respect and kindness, and always look for the brightness in life and the positive in each other? 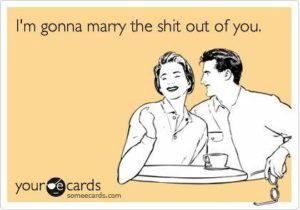 Me: Will you respect each other’s uniqueness, inspire one another’s fulfilment, compassionately support each other through all the changes of your years together, and encourage each other’s dreams and aspirations while creating new ones together? The couple then recited their own personal pledges to each other. Reading this back now, I’d forgotten how awesome this was and the personal touches, like having the mums participate always make elements like these so special. Is a hand-fasting for you? I hope so, because they are so beautiful and full of meaning, but at the end of the day, it must feel right for you. If it’s not your thing then they’ll be plenty of other things that are, and luckily for you I’ve written about them too! So check out these these other symbolic rituals and see if there’s any you like the look of and if not, why not think up your own symbolic ritual just for you!